I’m a born-and-raised California girl, so when it comes to coastal cuisine, one thing is certain: We know a thing or two about fish tacos! Whether you like them broiled, baked, deep-fried or grilled, there’s no end to the fish taco flavors one can dream up 365 days a year. 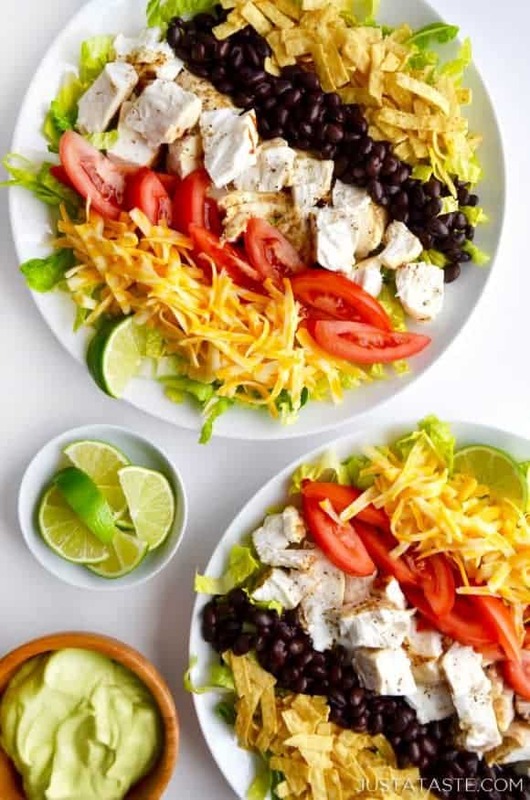 My latest and most favorite fish taco preparation comes in the form of a salad complete with all of the classic taco fillings that will have you eating a rainbow of fresh flavors and colors. Gone is the guacamole, and in its place is an extra-creamy and yet totally healthy 5-ingredient avocado dressing made with yogurt, garlic, lime juice and honey. While pan-fried fish is my go-to in colder months, warmer weather signals the arrival of foil packets on the grill, which means grilling fish has never been so easy or hassle-free. 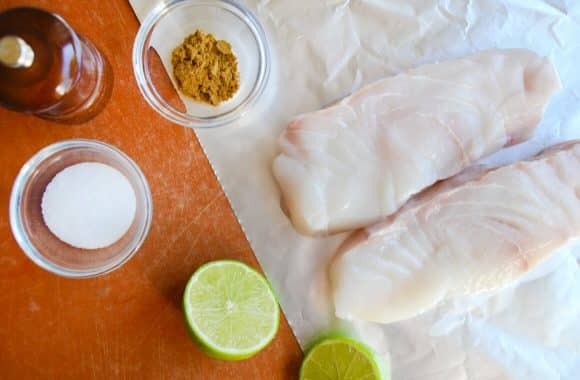 Simply wrap halibut filets (or any other preferred fish) seasoned with lime juice and ground cumin in foil then pop the packets onto a preheated grill. 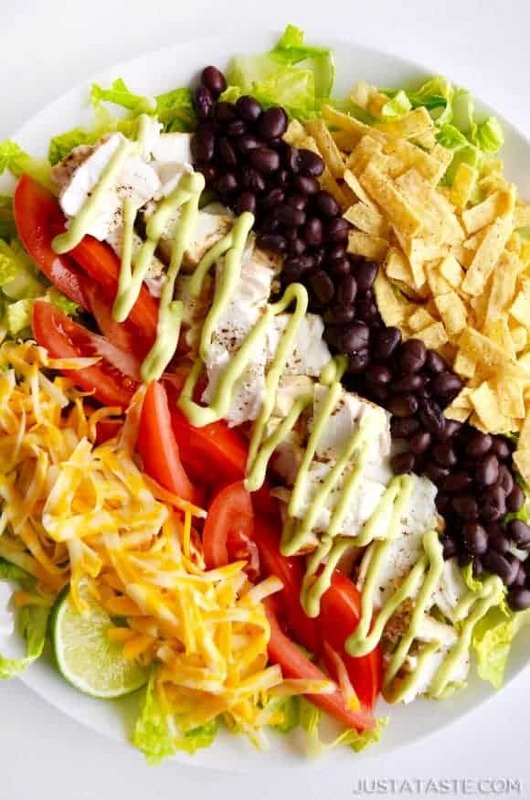 Ten minutes later, the star of your fish taco salad is ready for its’ close-up atop a bed of crunchy Romaine lettuce, black beans, shredded cheese, diced tomatoes and tortilla strips. And clean up consists simply of crumpling up foil and tossing it into the trash. Big win! I’ve teamed up with the creative minds at Reynolds Wrap® to share this recipe as part of their Endless Table program, which is a mesmerizing Instagram feed of delicious dish after delicious dish that’s seemingly, well, endless! Head on over to Instagram to check out their feed then fire up those flames for the ultimate quick and healthy addition to your menu. Disclosure: This post is sponsored by Reynolds Kitchens. All opinions expressed are my own. 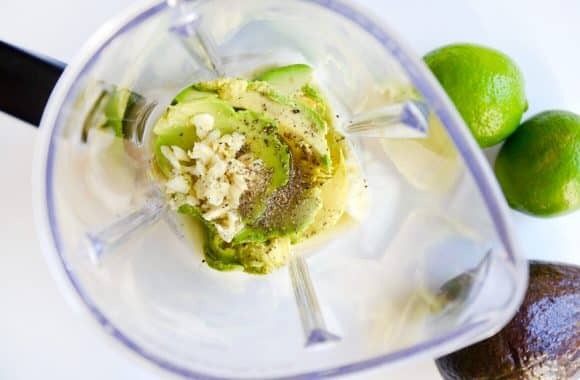 Make the avocado dressing by combining the avocado, yogurt, garlic, lime juice, honey, 1/2 teaspoon salt and 1/4 teaspoon pepper in a blender. Blend until creamy (the dressing will be thick) then cover and refrigerate the dressing while you make the salad. Preheat the grill for 10 minutes on medium heat. Prepare the foil packets by placing two halibut filets each on a sheet of Reynolds Wrap® Aluminum Foil. Squeeze the lime juice atop the filets then sprinkle them with the cumin and a pinch of salt and pepper. Fold and crimp the edges together to form sealed foil packets. Place the foil packets on the grill, close the lid and grill the fish until it is cooked through and flakes easily, 8 to 10 minutes. (The fish should reach an internal temperature of 130°F.) 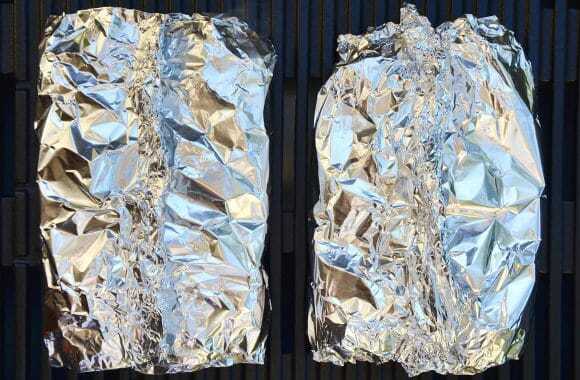 Remove the foil packets from the grill and unwrap them. 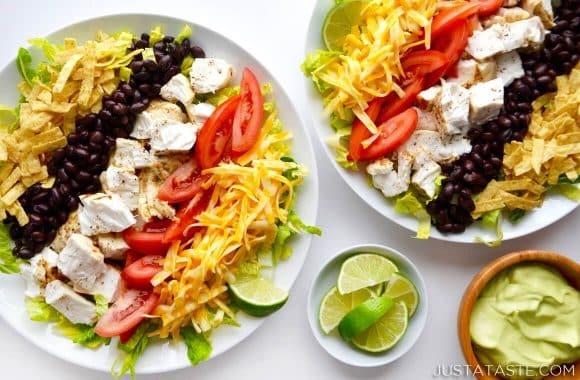 Prepare the taco salad by layering the lettuce, black beans, cheese, tomatoes and tortilla strips on serving plates. Arrange the grilled fish on top of the salads then drizzle with the avocado dressing and serve.